HIMMI HYME! 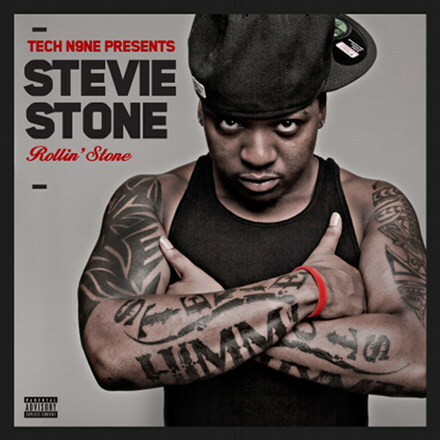 On 6/12, Tech N9ne Presents Stevie Stone – Rollin’ Stone will hit stores everywhere – here’s your chance to pre-order your copy! 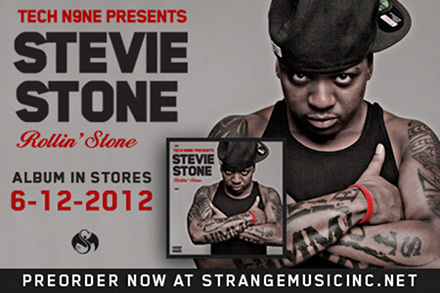 Stevie Stone’s Strange Music debut release, Rollin’ Stone, is sure to be the album you bump all summer long! With heavy-hitting tracks like “808 Bendin’”, “Get Buck” and “Oneness”, along with features from Tech N9ne, reggae legend Peetah Morgan, Yelawolf and more, this is one album that’s not to be missed! With your preorder, you’ll receive an autographed copy of Rollin’ Stone, a limited edition Rollin’ Stone shirt (XL only), a Rollin’ Stone sticker and the bonus download mp3 track, “In The Game”, that you can’t get anywhere else.